To Samantha Hopkins, Crissy Huffard, and Edward Davis who went through commencement in May and received their Ph.D. hoods from their advisors, Tony Barnosky (Hopkins and Davis) and Roy Caldwell (Huffard). Sam is also the recipient of an Outstanding Graduate Student Instructor Award. To Sarah Rieboldt, who completed her doctoral dissertation on Cambrian brachiopods and extinctions. She was co-sponsored by Carole Hickman and Jere Lipps. To Scott Fay, Liz McKinzie, Jan Vendetti, Michelle Weber, and Becky Williams who all passed their oral exams this semester. Liz was also awarded an NSF Graduate Fellowship. To UCMP Research Associate, Armand de Ricqles, of the College de France and Universite de Paris VII, who was named to the Legion of Honor on January 1st of this year. To Carole Hickman, who was elected by the American Microscopial Society to serve as President Elect during 2005, President in 2006, and Past President in 2008. 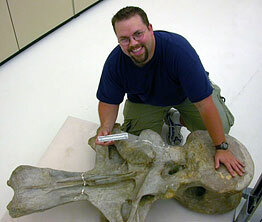 Matt Wedel with an Apatosaurus vertebra. and he has been accepted as a Graduate Student Fellow of the Berkeley Natural History Museums GK12 “Exploring California Biodiversity Program” (see article). To Andrew Lee, who was awarded a one-semester Dr. Frank Elmer Peabody Memorial Fellowship from UCMP. To Elizabeth Perotti for her P.E.O. Scholar Award from PEO International. PEO is an organization dedicated to higher learning for women. To Alan Shabel, who received a Wenner-Gren Foundation Grant to support his field work in Africa. To Matt Wedel as the recipient of the 2005 UCMP Louderback Fund award.